It was easily the wettest weekend of the summer … the mist closed in around the Kaimai ranges and the rain settled. You’d totally be forgiven for thinking ‘ah – let’s just go with Plan B and move it all indoors’. But not Jasmine & Karl. Their dream of a wedding in a grove of native forest, surrounded by their closest friends and family, was totally going ahead. We were pretty stoked on that. The thing I believe is most important is not WHAT happens – but HOW you react to it. Jasmine & Karl were total champs – rocking the umbrellas, massive smiles from ear to ear – just out there, enjoying every second of their wedding day. 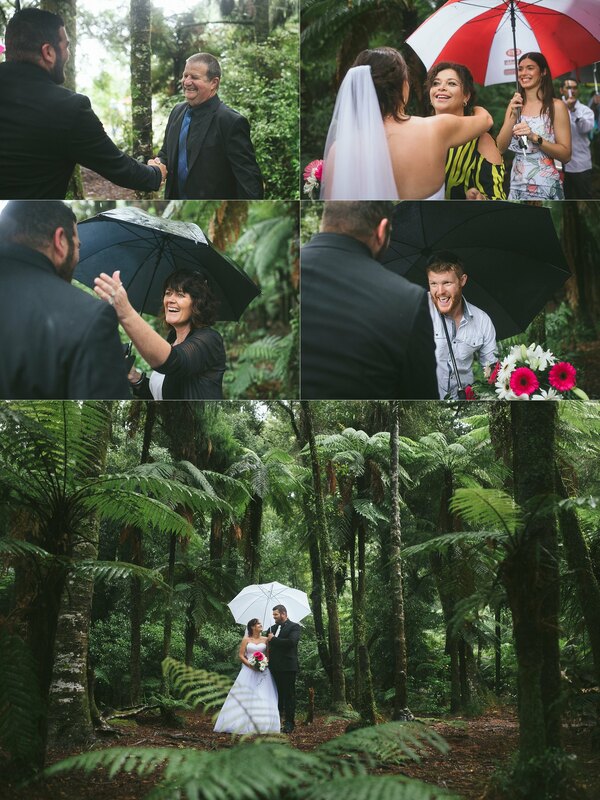 From the muddy arrival in the ute, to the saturated trees, to the Nike sneakers hidden under the wedding dress – it was all perfect. We got out there & got just as soaked (thank goodness for decent camera gear… and failing that, for insurance! )… and had a blast. I was stoked to have my friend Mike Hill along for the ride too – not often that we get to hang together and capture images. Mike’s ninja-like frame makes him epic at sneaking up on people and getting the best reaction shots! Jasmine & Karl – thanks for having us along to share in your day. But more so – thanks for rocking it in the rain and smiling / laughing your way through the day. That made all the difference. Here’s a little sneak peek of the images – there are hundreds more to follow soon. Until then… enjoy. If you’ve enjoyed Jasmine & Karl’s wedding photos – be sure to leave them a comment in the box below. We know they’ll be stoked to hear from you!